President Ellen Johnson Sirleaf insists competing development priorities accumulated from Liberia’s civil war delayed her government’s commitment to refurbish the country’s major airport – Roberts International Airport (RIA) in Margibi County. 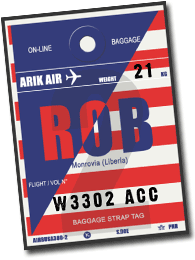 RIA, constructed in the 1970s, was left deteriorated due to poor maintenance causing difficulties for airlines and created setbacks for Liberia’s aviation sector. On Monday, President Sirleaf reechoed that several other development needs of the country including schools, hospitals, and civil servants’ salaries had to be met which she said pushed the modernization of the airport at the bottom of her priority list. “So we made a decision to postpone the development of RIA because we felt that the usage of RIA was truly the high flies for those who could afford to take a little more pain and suffer some inconveniences to allow us to concentrate on those that benefited the people,” she said. The Liberian leader was speaking during the partial dedication of the under- construction passengers’ terminal and newly completed runway at the RIA. Wil Boko Freeman, RIA managing director, said refurbishing the airport would help the country regain its pre-war status as a regional aviation hub in West Africa and a destination of choice for travelers. He expressed optimism that the completion of the terminal and runway would also attract more international flights to the country and help improve Liberia’s economy. The modernization of the airport began in November 2016 following feasibility studies and the acquisition of loans from the Export-Import Bank of China and the Saudi Development Fund. President Sirleaf said it was a “conscious hard choice” to keep pushing the project forward and that her government did not anticipate it would have faced “hard shocks”. “It wasn’t easy at the time when we started to work on rebuilding the airport because we were facing financial constraints,” Sirleaf said. Liberia had ‘good friends’ like China and the Saudi Development Fund who were willing to demonstrate confidence in the future development of the country, she said. She lauded the commitment of the two Chinese engineering firms – Sino hydro and China Harbour Engineering Company LTD – to the level of works done so far on both the terminal and the runway, while stressing the intervention of the Export-Import Bank of China for providing the US$50 million loan for the terminal and the Saudi Development Bank for funding the runway project. Chinese Ambassador Zhang Yue described the urgency of the project and the task that was at hand when the work started as “mission impossible” for the contractors. But he said, “Only Chinese companies have the gust to take-on such though job” and implement it. Due to the significance of the airport, the construction works were ongoing while the facilities were in use. Ambassador Zhang said the engineers used “China speed, quality and reputation” to achieve the progress thus far despite the challenges from the rainy season. “The whole process of the project embodies modern and high technology,” he said, adding it is the first time for Chinese construction firm to adopt such technology in executing a project in Liberia. “With the renewed runway and the forth-coming brand new passenger terminal, Liberia Airport Authority can provide better service to the people and the flow of goods. I believe this will usher in more airlines and inject dynamics to economic recovery,” he said. Ibrahim Al Sahi of the Saudi Development fund and the Arab Bank added that modernization of the airport infrastructure would attract more tourists to Liberia and enhance the economic potential of the country. He assured the willingness of the Arab Bank to provide more “soft loans” to Liberia in order to buttress the country’s development agenda.